Cloudberry is a herb native to alpine and arctic regions. The edible fruit colored golden-yellow having a form similar to the raspberry or blackberry. 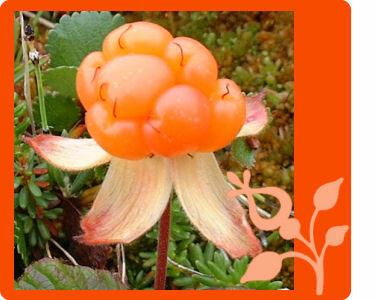 Wild growing cloudberries are highly valued and a favourite wild fruit of the Arctic region. Cloudberries are soft, juicy and about the size of raspberries. Cloudberries begin ripening in the end of July or early August and are picked by hand. They are initially pale red before ripening to an amber colour. Cloudberries grows naturally in bogs across arctic and subarctic regions of the northern hemisphere mainly in mountainous areas but can also be found along the sides of new forest ditches and forest roads. The undrained wetlands produce the highest yield. They grow in the all Nordic countries, especially in Finland and much in the Baltic states also across northern Russia and Siberia. In North America cloudberries are native to Canada and Alaska. The plant is well-suited for Arctic regions because it can withstand temperatures as low as -40 °C. The berries are preferably eaten fresh but you can find cloudberry jams, ice cream, juices and liqueurs. In Sweden, it is very popular to serve warm cloudberries with vanilla ice. Cloudberries are rich source of vitamin C (50 to 150 mg / 100 g of cloudberries). High benzoic acid content acts as a natural preservative. Cloudberry seed oil is particularly rich in vitamin E.
Tea made from cloudberry leaves was used in ancient Scandinavian herbal medicine to cure urinary tract infections. Cloudberries are applied in curing vitamin deficiency diseases and hypovitaminosis C. 75 grams of the cloudberries covering one’s daily requirement of vitamin C.
Cloudberry is a balanced source of important compounds, which are central for skin care and have multiple beneficial effects. Active ingredients extracted from cloudberries offer bioactive properties: protection against the effects of stress, environmental pollution and UV radiation. Carotenoids, phytosterols and vitamin E fighting the ageing process of the skin. High C-vitamin and benzoic acid content support the preservation of the cosmetic product. Seed oil is also used in the production of cosmetics. Mostly as row material for food industry. CONTACT | Copyright (c) 2011 www.arcticberries.se All rights reserved. Bsed on a Design by Free CSS Templates.